You have to like a coach who can conduct a 30 second post-game press conference to succinctly sum up a game. Why was the coach mad? Read the official recap of the Rangers' 5-4 shootout loss to the Atlanta Thrashers here. Depending on what happens during the next 7 games, the Rangers may rue their season-long charity fest of starting Steve Valiquette in goal on the road against non-playoff teams. I have met him and I like him but this season he has not been a capable backstop during several important games. 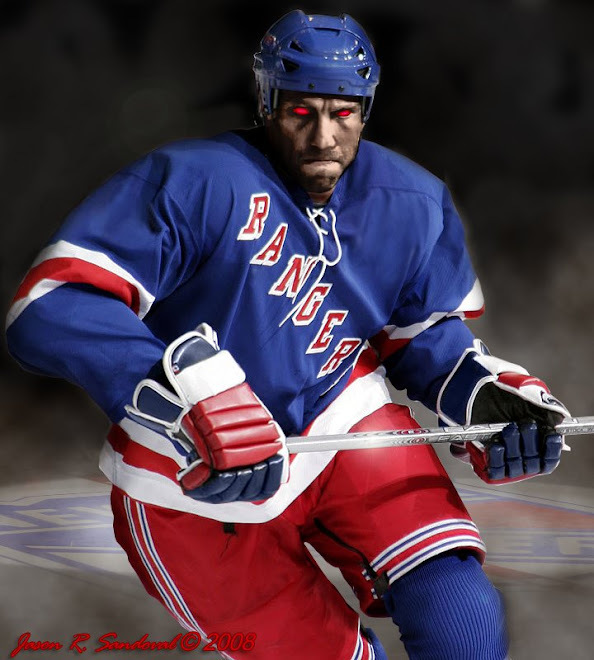 He also expressed the thought Ranger fans have been saying for the past 2 seasons: "Where is our killer instinct when we're playing someone lower in the standings?" Let's face it. His stats during 3rd periods of games have been mediocre, to be kind. Lit up for 5 consecutive goals in Toronto to blow a 2-0 lead, lit up for 6 in Dallas in that 10-4 demolition, and but for the technicality that Ilya Kovalchulk scored just before the 2nd intermission last night, Valley gave up 3 consecutive goals in the last 20:20 to surrender a 4-1 lead en route to a 5-4 shootout loss. I don't have an issue with playing Valiquette -- but he has not been the reliable player of recent seasons. Everyone is entitled to a slump so I will be kind here but point out that we are not talking about Scott Clemenson here. This was a totally dispiriting loss because Drury had a monster game with a power play goal and 2 assists. The Russian duo of Zherdev and Antropov scored and the Rangers used 2 power play goals to jump to a 4-1 lead with 30 seconds to go in the 2nd period. But dark omens were circling in spite of the lead. The Thrashers had the better of the play at even strength but were giving away the game thanks to their season-long awful PK unit. Who knew the Drury's apparent 1st period goal that would be disallowed because of a high stick would matter? The Atlanta goalies -- Lehtonen in the first and Hedberg in the 2nd -- looked shaky and yielded 4 goals. But all of a sudden, both units tightened up and the Thrashers did not allow the Rangers to score again. Like the Senators game on Sunday, the Rangers did not take enough advantage of what their opponents offered -- scoring chances and pitiful goaltending. When Kovalchuk scored on his wrap-around late in the 2nd, you should have known that the 3rd was going to be a problem based on Valiquette's history this season. While Kovalchuk made a speedy move around the net, I question why Valiquette was so far to the left of the left goalpost. His positioning (and I watched the replay several times) was awful and cost him any chance to recover to stop Ilya. shot past Valiquette in round 6 of the shootout. 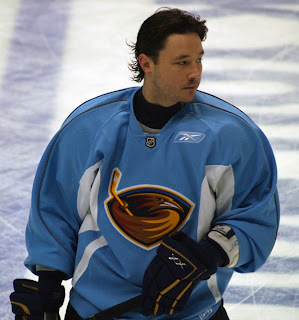 With the playoff pressure off, Kaptain Kovalchuk has been on a scoring streak with 22 points in his last 13 games. We oldsters use to call this a salary drive in baseball -- your team is long out of contention, the pressure is off and you pad your stats so next season's trading card makes you look like the superstar of the team. In other words, where were you, Ilya, when your team could have used you? Stats-padding? I'm carrying this team. Right to 13th place in the East. This game epitomizes why the Rangers are not an elite team. Elite teams do not lose to non-playoff teams at home (Ottawa) and blow 3 goal leads on the road to another non-playoff team. Elite teams have a killer instinct and do not leave points on the table -- the Rangers garnered 3 out of 6 this week when easily 5 was in their reach. Elite teams take advantage of the weaknesses of their foes -- bad goalkeeping and a terrible penalty killing unit. The Rangers were 2 for 10 on PP opportunities during the game. 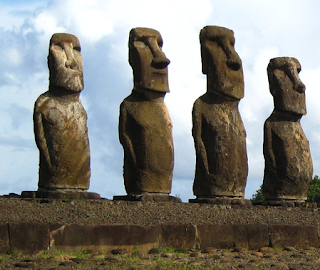 During the pivotal 5 on 3 advantage early in the 3rd period that they failed to capitalize on, the Blueshirts had less movement than the statues on Easter Island. meet your 2008-09 New York Rangers power play unit. Roszival's absence was felt as the other defenders spent many minutes on the ice and as the game wore on, it showed. The usually reliable Girardi and Staal were on the ice for all 4 of the Thrashers' goals. On the tying goal, Staal made the deadly mistake of following one Thrasher beyond the net while leaving Girardi in the crease to cover 2 Thrashers. Meanwhile, White netted the goal while Dubinsky watched from behind as well. This was simply brutal play late in the game when the score was 4-3. I noticed that Sauer's ice time again was curtailed during the final stretch of the game and overtime. Montreal and Florida both won on Thursday night so they crept closer. The "easy" part of the Rangers schedule is now finished. They visit the Igloo for a Saturday afternoon game and entertain the Devils at the Garden on Monday. Don't forget upcoming trips to Carolina and Boston and Philly. 3 points left behind this week in the Ottawa and Atlanta games may prove fatal. Tony - Good stuff! Hopefully, they can dig deep on Saturday and get the two points. Losing to teams not in the playoffs like Ottawa and Atlanta is unacceptable at this point in the season, but it's a million times worse when you have a 3 goal lead late in the 2nd. How the Rangers got a 3 goal lead was amazing considering how terrible they played. It was inevitable the collapse by the Blueshirts, you could feel it coming. Atlanta was ready to play and the Rangers simply were not. On to Pitt, time to show what they got!